The Global Social Economy Forum – GSEF 2018 represents the fourth edition of the Global Social Economy Forum (GSEF), an important international conference which commenced in the city of Seoul in 2013, in cooperation with its local allies in social economy. The 2014 edition, held for the second time in the capital of South Korea, led to GSEF establishing itself as a permanent international association which brings together local governments and stakeholders in civil society who recognise social economy (SE) as a key factor for local economic development. In 2016 the city of Montreal and the Chantier de L’Ëconomie Sociale jointly organised the forum in Montreal, improving cooperation between local governments and social economy stakeholders for the development of cities. 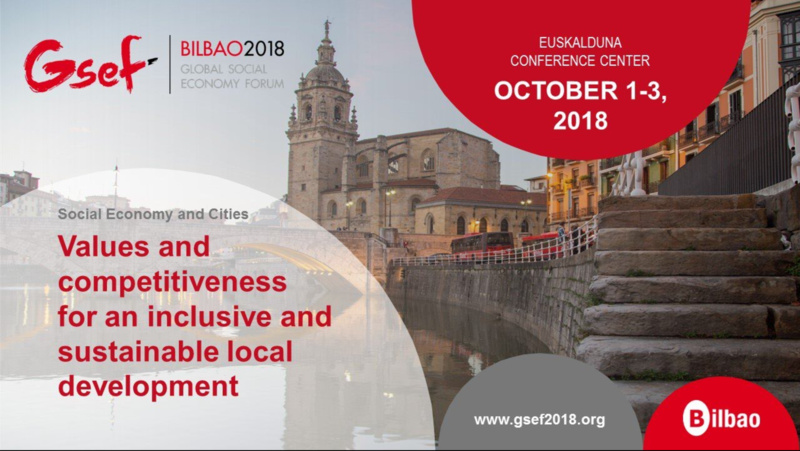 GSEF 2018 will be held in Bilbao, the first week of October, in an event organised by Bilbao City Council. The central theme is that of “Values and competitiveness for inclusive and sustainable local development”. More specifically, GSEF2018 will present initiatives that have created employment, improved the quality of life, strengthened social cohesion and inclusion, thus contributing to the competitiveness of cities and regions, bearing in mind the key factor of sustainability, fostering inclusive and sustainable local development of cities. To share best practises throughout the world on public policies jointly built for the development of the social Economy in urban areas. To promote knowledge of SE and recognition of its role in local development, especially between public stakeholders, the public in general and the private sector. To reinforce GSEF and its capacity to carry out its mission. About 1,300 attendees are expected (registered as of 17 September) to attend the 5 plenary sessions and 42 workshops organised in 9 work sessions, distributed in 5 parallel halls. Promoting Social Economy: trend or commitment? Panel of mayors and mayoresses to debate together with SE representatives about what it means for them, at a political level, to commit to Social Economy as a central core of social and economic development of their cities. This session is aimed at highlighting one of the priority objectives of GSEF which is to link the future of cities with social economy. It is nearly a cliché to point out that the 21st century is the century of cities, as that is where the population is concentrated and where a significant part of global challenges become apparent: the fight against climate change, diversity management, optimisation of basic resources, the fight against inequality and poverty, etc. The session aims to reveal Social Economy as the great ally for local governments when confronting these challenges. Plenary session aimed at presenting internationally the orientation of different policies in favour of the development of Social Economy, inviting a dialogue among personalities. Taking as reference various local initiatives of significance in relation to the promotion of Social Economy in cities, discussion is proposed on its keys. As closing plenary session, the aim is to show, from different angles, the capacity of response from Social Economy in favour of sustainable and inclusive local development. Also worth highlighting, the MONDRAGON experience will have a specific workshop, and entities such as the European Economic and Social Committee, Social Economy Europe, CEPES (Spanish Business Confederation of Social Economy) , OECD and the ILO are also present in the Forum. This entry was posted in NEWS and tagged Events, Others, Social Economy, Values, Workshop. Bookmark the permalink.